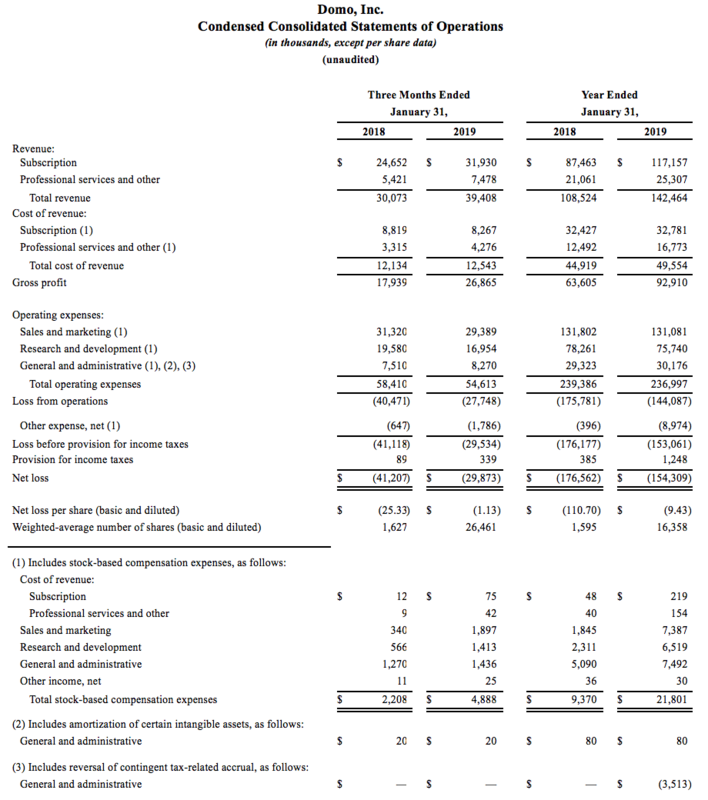 Silicon Slopes, Utah – March 13, 2019 – Domo, Inc. (Nasdaq: DOMO), provider of the leading cloud-based operating system for business, today announced results for the fourth quarter and fiscal year ended January 31, 2019. Domo also announced Carine Clark, Banyan president and CEO, has joined its board of directors. Carine has also served as the CMO of Symantec and also as the CMO of Altiris, both of which were public companies at the time. Carine will fill the seat of early investor and board member Glenn Solomon from GGV Capital. Domo announced a new commissioned Forrester Consulting Total Economic Impact™ (TEI) study which determined that organizations deploying Domo can achieve an overall return on investment (ROI) of 434 percent over three years and recoup their investment in less than one year. Domo was named to two Q1 2019 Constellation ShortLists™, one for Marketing Analytics Solutions and the other for Cloud-based BI and Analytics Solutions. Domo was ranked #1 for Usability and TCO/ROI in Ventana Research’s 2019 Mobile Analytics and Business Intelligence Value Index. Domo announced the Domo Integration Cloud, a new Integration Platform as a Service (iPaaS) solution that leverages the power of Domo’s back-end data integration and management features and comprehensively addresses data integration, access and governance. Domo announced its latest industry-focused solution, the Domo Media Suite. The Domo Media Suite includes Apps for media buyers and publishers to consolidate complex systems and data sets, and drive better performance from their media campaigns. Domo plans to host a conference call today to review its fiscal 2019 fourth quarter and fiscal 2019 full year financial results and to discuss its financial outlook. The call is scheduled to begin at 3:00 p.m. MT/ 5:00 p.m. ET. A live webcast of the event will be available on the Domo Investor Relations website at https://www.domo.com/ir. A live dial-in is available domestically at (877) 491-5762 and internationally at (763) 416-6939, with conference ID#9892795. A replay will be available via webcast or at (855) 859-2056 or (404) 537-3406 until midnight (ET) March 27, 2019. 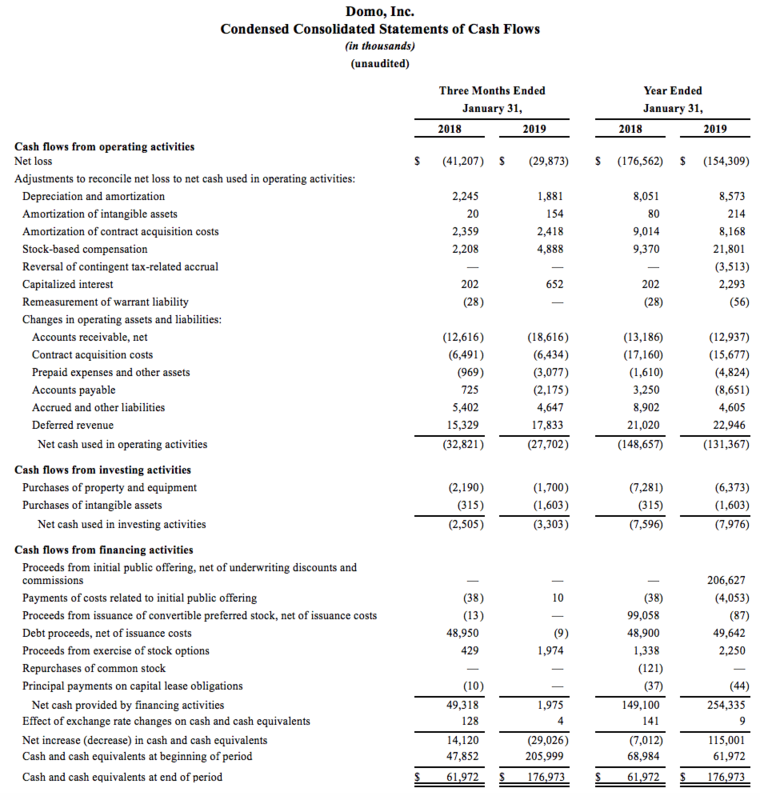 To supplement our condensed consolidated financial statements, which are prepared and presented in accordance with Generally Accepted Accounting Principles in the United States of America (GAAP), we reference in this press release and the accompanying tables the following non-GAAP financial measures: billings, non-GAAP subscription gross margin, non-GAAP operating expenses, non-GAAP operating loss, non-GAAP operating margin, non-GAAP net loss and non-GAAP net loss per share. In computing these measures, we exclude the effects of stock-based compensation expense, amortization of certain intangible assets and the reversal of contingent tax-related accruals. 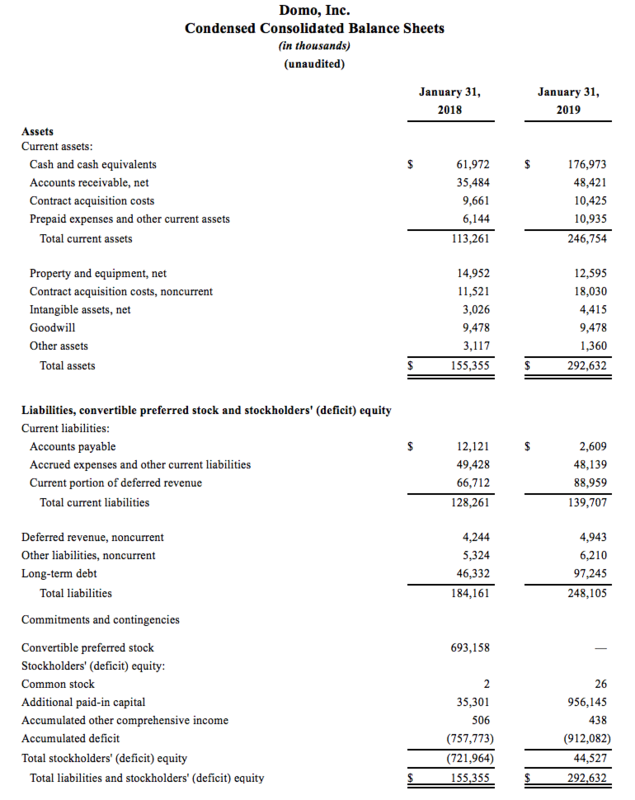 The presentation of this non-GAAP financial information is not intended to be considered in isolation or as a substitute for, or superior to, the financial information prepared and presented in accordance with GAAP, and our non-GAAP measures may be different from non-GAAP measures used by other companies. 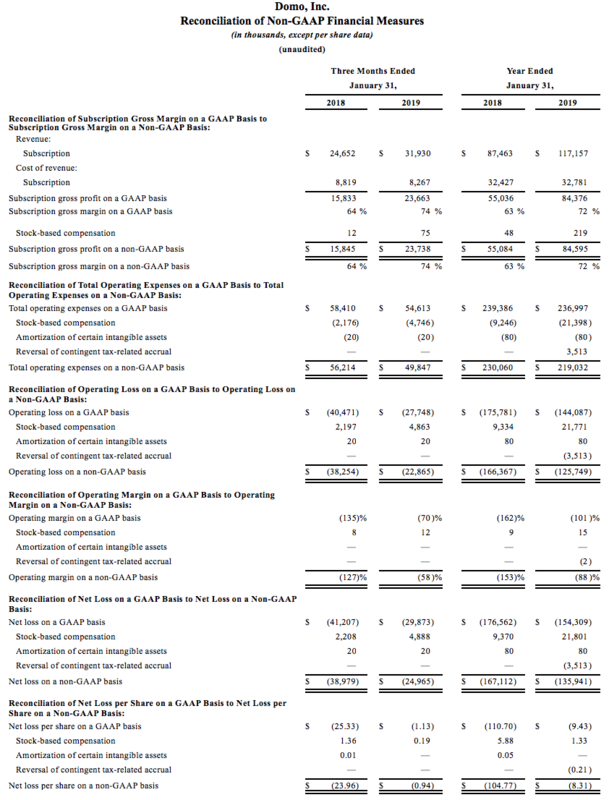 For a reconciliation of these non-GAAP financial measures to GAAP measures, please see the tables captioned “Reconciliation of Non-GAAP Financial Measures” included at the end of this release. This release contains forward-looking statements within the meaning of Section 27A of the Securities Act of 1933 and Section 21E of the Securities Exchange Act of 1934 and the Private Securities Litigation Reform Act of 1995. These forward-looking statements include statements regarding our future growth, demand for our products and services, our financial outlook for Q1 fiscal quarter and full fiscal year 2020, and results for future periods. Forward-looking statements are subject to risks and uncertainties and are based on potentially inaccurate assumptions that could cause actual results to differ materially from those expected or implied by the forward-looking statements. Actual results may differ materially from the results predicted, and reported results should not be considered as an indication of future performance. The potential risks and uncertainties that could cause actual results to differ from the results predicted include, among others, those risks and uncertainties included under the caption “Risk Factors” and elsewhere in our filings with the U.S. Securities and Exchange Commission, including, without limitation, the Prospectus related to our initial public offering filed with the SEC on June 29, 2018 and the Annual Report on Form 10-K for the fiscal year ended January 31, 2019 expected to be filed with the SEC on or about April 10, 2019. All information provided in this release and in the attachments is as of the date hereof, and we undertake no duty to update this information unless required by law.